Firebombed in the Second World War, just like Dresden, Kiel and Berlin, the English City of Coventry suffered enormous damage. In one night on November 14, 1940 over 500 tonnes of bombs were dropped on the city. More than 550 people were killed, more than 1,200 injured and much of Coventry’s town centre was destroyed. The poignant symbol of that destruction for many was the burnt out shell of the city’s medieval cathedral. 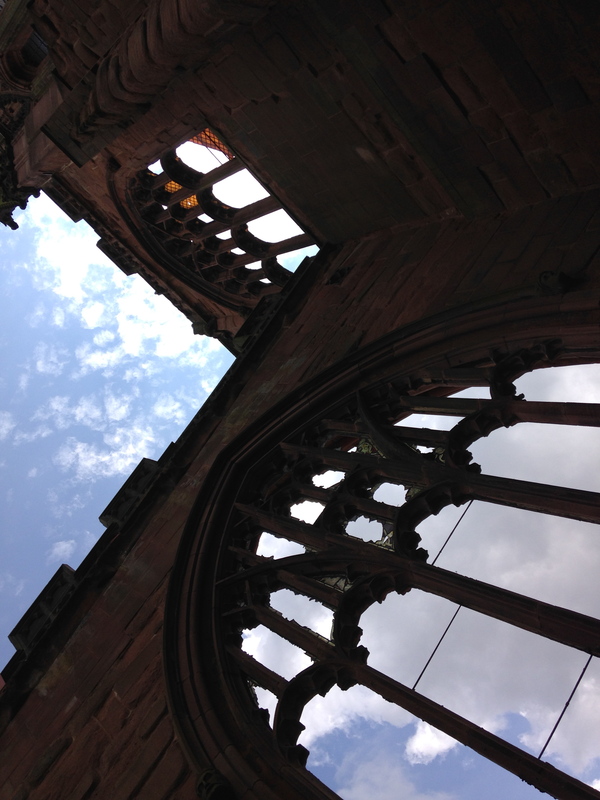 Coventry has since become an inspiration in the way it transformed its pain and hatred into forgiveness. Now, it is seen as a Phoenix risen from the ashes and a city of peace and reconciliation. After the war the city and its cathedral were rebuilt, not as they were—crowded medieval streets around an ancient cathedral—but in accordance with a sweeping new vision of city centre living. Perhaps the mark of any truly great building is its timelessness. No matter when it was built it should appear fresh to successive generations, with something new, or at least ageless, to say. As such, perhaps it should not appear fashionable when designed, for fashions change; and perhaps it should even be disliked by its contemporary art critics as the very mark of its universality. Age has nothing to do with it. The gothic spires of our medieval cathedrals despite being more than 500 years old certainly do this. Sydney Opera House with its billowing roofline, built only a single generation ago, does it. And so does the Senedd or Welsh National Assembly Building in Cardiff Bay completed as recently as 2005. What doesn’t do it, I’m afraid, is the stone and concrete box they built in the early 1960s as the new Coventry Cathedral. The Scottish modernist Sir Basil Spence was the architect who won the competition to give wings to Coventry’s Phoenix and claimed to have designed ‘a plain jewel casket’. If that indeed had been what he had done, then maybe it would not look like the dated sixties architecture it is today. It is a concrete box, sheathed in pink sandstone and topped off with a spire that looks like an RKO radio beacon. Overall, the construction looks simultaneously dated and temporary. Spence was a fashionable architect who went on to transform Glasgow’s Gorbals from a feral underground to a soulless concrete jungle of high rise blocks. Despite its modernity that urban experiment has since itself been demolished. Looking at his cathedral, I could not help but wonder whether the same fate might one day befall his ‘masterpiece’. However, there are undoubtedly jewels to be seen in the casket—the stained glass walls are wondrous to behold. And the engraved glass of the Great West Screen of Saints and Angels by John Hutton, and Jacob Epstein’s sculpture of the archangel St. Michael casting Lucifer out of heaven that hangs, almost hovers, on the outside walls are marvels. Interestingly, none of these ‘jewels’ were designed by Spence. He merely contributed the shed in which they hang. But if you want timeless beauty stroll round the ruins of the original bombed out building, and wonder. Adjacent and adjoining, much is gone, but the sense of grandeur and the soaring lines that must have inspired generations of worshippers are still there. There are even fragments of ancient coloured glass still in the gothic traceries of the windows to tantalise like the flash of a gem in the pan. Just as great buildings appear timeless, so do great ideas. No matter when you first learn of them, they resonate with immediate relevance. New ears hear great ideas afresh in schools and universities every day, and as teachers we know just how great they are when we watch our students faces. The first time you see the Parthenon, or the Taj Mahal or stand beneath Sir Christopher Wren’s dome in St. Paul’s Cathedral, tilting you head back so far that you almost fall backwards as you try to take in the majesty of it all—that’s the same feeling as hearing a great idea. The structure of the atom, the equivalence of matter and energy, the code wrapped inside a molecule of DNA, evolution—these are just some of the great ideas of science that are as alive today as when they were first proposed. They have not faded and dated and fallen out of fashion. A classic is timeless, whether it be as flimsy as a building or as monumental as a thought. 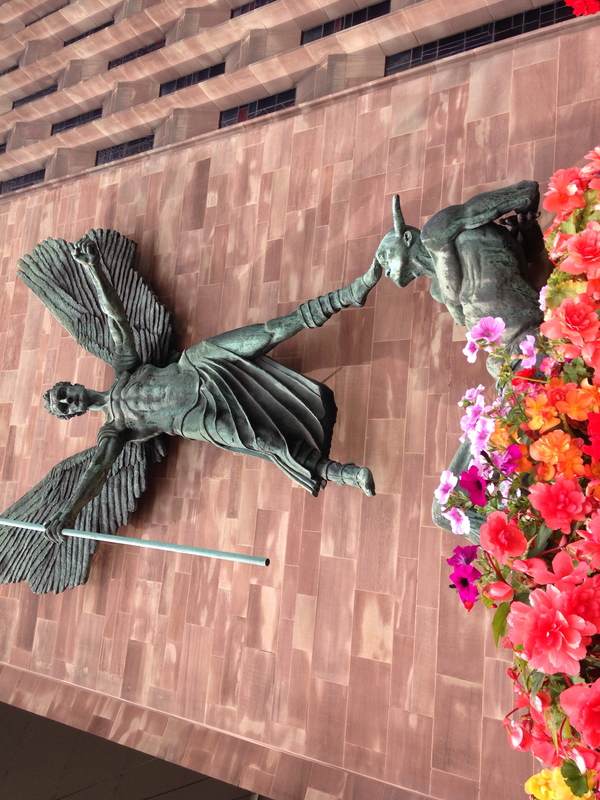 While the new St. Michael’s Cathedral in Coventry might, at least to my eyes, appear firmly of an age, there is a timelessness, and therefore a greatness, to the idea on which it was built. That idea was forgiveness and it is one that is at the very epicentre of what it means to be human. The people of Coventry could have turned inward and lost themselves in their anger. Instead they looked upwards and outwards and held out their hands to the bombers. Forgiveness has very little to do with those who are being forgiven; it has everything to do with those who forgive. The act of forgiveness is a breaking of the ties that bind us to our resentment and our outrage—both of which are weighty loads to carry for a lifetime. Forgiveness offers the victim a release and a chance to move on, unencumbered. When they were sorting through the charred debris of the Cathedral that winter of 1940 they found long iron nails used by the medieval carpenters who had built the roof. Later they welded them together making crosses and sent them to communities around the world including those in the German cities who lost their cathedrals because of the war. Such a symbol of renewal was a poignant affirmation of Coventry’s forgiveness, and of the tirelessness of the human spirit. Symbolism is important because of its power. And it is at its most powerful when it is simple. Three medieval nails welded together speak a universal language and their message is clear: Forgive them.